I found this dresser at a flea market for $100. I literally think it might have been my best find ever. It's so well made, its signed on the inside of the drawers (which proves quality & craftsmanship), and the curves on this girl are just gorgeous. I love the marbled wood look that was on the dresser before and the motif in the center, but I think it was lost on the piece. The gorgeous gold hardware just faded into the background. I felt it deserved so much more. I went with Farrow & Ball Wevet paint in full gloss, to give it a bit of that wet look. I knew the stark white would highlight all the lines and it did! The only thing about the white, you can see the imperfections. Although, there is something about imperfections that I actually like and I'm hoping that over time, more happen. I sort of like that worn look. It reminds me of Paris. I also put up the tapestry piece I scored while at Round Top this Spring. I really bought it for the gold frame with black velvet trim and thought about changing it out for a mirror. For now, I like it as art for the bedroom, its very romantic. I'm all about vintage art. Want more DIY decor advice? Join in on my insider newsletter fun. There is nothing like a really stylish bouquet of fresh flowers at home that makes me smile more. 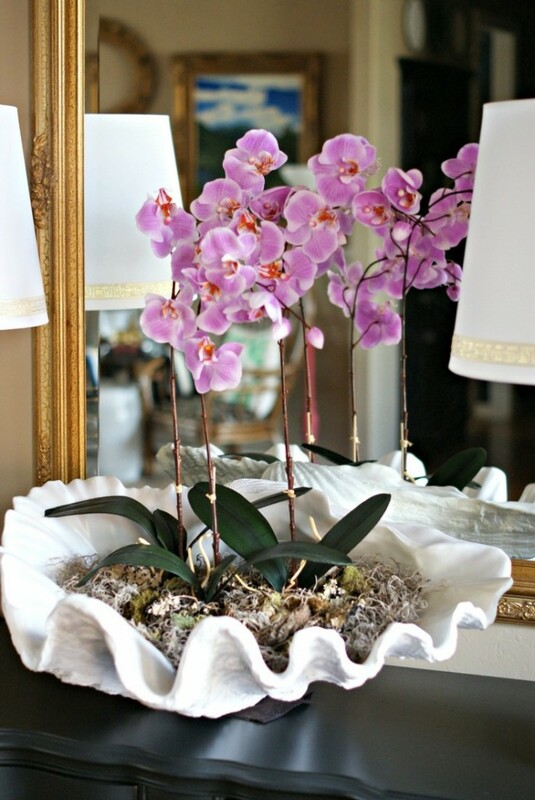 Except for maybe this cute idea for an orchid arrangement. I have an oversized clam shell that has just been calling out to me. She's currently stuck on top of my kitchen cabinets hiding her beauty away. This weekend, I think I am going to bring her out and cleverly style it with my favorite orchids from the cute little flower market on my block. I personally love all white orchids but these purple ones are just as stunning. Why not try this idea this weekend, it really would make the perfect centerpiece for that Saturday night dinner. Don't you think?